An anabolic steroid cycles refers to the time frame anabolic steroids are being used. This time frame is often referred to as “On-Cycle.” When steroids are not being used, this is referred to as “Off-Cycle.” For the on-cycle phase, there are countless options and stacks. “Stacks” refer to the combination of anabolic steroids as well as non-steroidal items used during the on-cycle phase. With hundreds of anabolic steroids, varying peptide hormones, SERM’s, AI’s, thyroid hormones and more, there are truly innumerable possible stacks. The options are so vast, every stack and cycle you undertake could be completely different. However, most steroid users will become comfortable with certain stacks they’ll discover specific combinations that yield the best results, and they will stick with those plans. Beyond testosterone there are several recommendations, general rules of thumb that most stacks and cycles are advised to follow. We’ll go over these, along with the testosterone rule in more depth, and in doing so, ensure your success. By following these rules, you will increase your chances of an enjoyable, safe and successful steroid cycle, and that is important after all, if it’s not safe we can in no way call it successful. If you’ve never supplemented with anabolic steroids before, it’s recommended that you keep things as simple as you can. You have no idea how your body is going to react to supraphysiological doses of a hormone. Further, you want to start with hormones your body is already familiar with, such as testosterone. Many will forgo this and immediately dive into massive stacks and cycles, and more often than not this is a crying shame. It won’t take much to see a big difference, and if you become familiar with varying anabolic steroids, overtime you’ll have a better understanding as to what works best for you. If you begin with numerous steroids in your cycle, if you have any problems, it is going to be extremely difficult to pinpoint what’s causing the problem. Equally important, you may have a hard time pinpointing which steroids bring you the greatest results. Start simple and work your way up. Once you have a few cycles and stacks under your belt, assuming you’ve enjoyed a positive experience, you can now consider moving to more advanced cycles. However, for many men there may be no need or desire to increase the number of hormones being used or an increase in doses. Many men will be satisfied with standard, basic cycles, and there is nothing wrong with that. A simple and moderately dosed testosterone cycle may be all you ever need, and such a cycle will work for you every single time. Your body isn’t going to magically adapt to where such a plan will no longer work. Despite this, many men will inevitably want more, and if they’ve enjoyed success with smaller steroid cycles, this can be fine. However, bigger stacks and cycles come with a word of caution that we need to discuss. All steroid cycles and stacks carry with them a strong risk to reward ratio, and regardless of your experience this will hold true each and every time. While a bit simplistic, the best way to look at it is the more you take the greater the reward, but the more you take the greater the risk. As risks increase, so does the need for protective measures. However, there will be a cut-off point there will be a point when the risk to reward ratio becomes severely skewed towards risk, and when this occurs you have without question left the realm of safety. The line that crosses over into heavy risk, where it exists cannot be answered with a one-size fits all answer. The anabolic steroids being used, as well as the individual’s unique genetic response will determine where this line falls, but there are general guidelines. For example, in order to receive a performance benefit from testosterone, most men will need a minimum of 300 mg per week of a single ester testosterone compound with 400-500 mg being far more efficient. As the dosing increases, so do the rewards, but so do the potential for adverse side effects. Most men will find 500 mg per week is normally very well tolerated, and most men can increase past this point to an extent. Many men can enter into the 750-1000 mg range and still remain healthy, but past this point, most all men will find the risk scale becomes severely unbalanced. When we surpass 1 g per week, estrogenic issues can often be problematic, and many men will find controlling them extremely difficult. As steroid cycles refer to the time in which we are actually supplementing with anabolic steroids, the obvious question is what is the acceptable time frame? What is the minimum for positive gains and what is the maximum amount of time in-regards to safety? This can be a difficult question to answer, but once again there are guidelines that will help you stay safe. Regardless of the steroid cycles you implement, no matter how basic or advanced, your plan is going to need to extend for a decent amount of time. The human body does not like change even if such a change is in its best interest it will fight it and do all it can to stay at its accustomed normal. We must allow enough time for this “normal” to change we must create a new set normal if we are to hang onto any of the gains made. However, even when this is done, if you are off-cycle for an extended period of time you are going to lose some of the gains made without the high influx of hormones present to support the gains you made they will not last forever. Gains made by the use of hormones, this is not fake muscle or strength, it is as real as any other gains that can be made. When you make gains in strength and size, they are supported by the nutrients you consume. Take away the nutrients and the support system falls apart. Hormones are also important, perhaps as important as food. Together with nutrients, the hormones in your body support your size and strength whether naturally occurring or provided exogenously. Take the hormones away, and again you have removed a support system. In order to create a new set normal, most men will find 8 weeks to be the minimum with 12 weeks being far more efficient. Longer will yield better results (to a degree) but will also increase the risk for potential side effects. For those looking for solid gains while remaining as safe as possible, 12-16 weeks of actual supplementation followed by an equal amount of time off-cycle is the best bet. This is an effective plan, and while absolute safety cannot be guaranteed, it will be the plan that carries the greatest potential for a safe experience. For some men, depending on their goals, this plan will not work. For the hard-core elite, the truly advanced steroid user, you will find they are often on-cycle far more than they are off. This is the only way such individuals can support the massive strength and size they’ve obtained. It’s not uncommon to see these men blast with 16-20 week cycles and only discontinue for 4-8 weeks. In some cases, they may not fully discontinue at all. In some cases, such men will simply drop to a low dose of testosterone for 4-8 weeks before beginning another 16-20 week blast. At some point in time they will probably come off everything, but while such use can be effective it also carries with it a massive potential for adverse effects. Novice to Intermediate: You have completed a few novice cycles and done so successfully. This means you have not suffered from severe side effects, have made decent gains but have reached a point where you want a little more. Intermediate to Advanced: Intermediate cycles are as much as most will ever want, and in truth, most all will ever need. If you cannot make fantastic gains with such plans, you need to re-examine your diet and training. If you have completed several intermediate cycles successfully, have a desire to reach freakish levels of muscularity an advanced cycle may be in store. 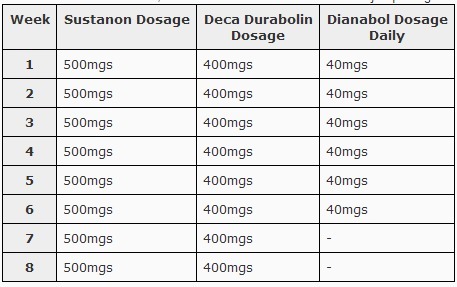 Beyond Advanced: The advanced steroid cycles listed below are incredibly powerful and carry with them a significant level of risk. However, some will surpass advanced plans. This is not something we can ever recommend, we cannot recommend such plans. However, we can tell you if you go beyond the advanced plans laid out below, you will be opening the door to possible problems that are not only potentially severe, but even life threatening.